Press and Awards- Wedding Cakes- for Jenny's Cakes. Wedding Cake Awards 'VOWS' Winners. 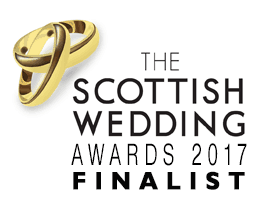 We are proud to have been VOWS nominees in the 'Wedding Cake Designers/Bakers' category for THREE years in succession, from 2016 to 2018! We were justifiably proud to be the winners of the VOWS Award for ‘Wedding Cake Designer/Baker of the Year’ for 2017. This was at the prestigious VOWS AWARDS ceremony and awards dinner, at a glittering ceremony in the Doubletree Hilton Hotel in Glasgow. The VOWS Awards is often referred to as the ‘Wedding Industry Oscars‘, among the most sought-after wedding industry awards. We mingled with over 700 fellow professionals from all over Scotland, and were thrilled to have been chosen as overall winners as Cake Designers of the Year! Please click the short video which shows the build-up to the announcement, and our on-stage highlights! 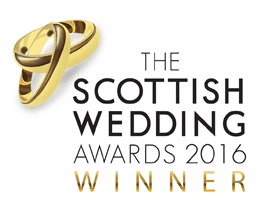 Our success is a result of lots of hard work and dedication from our team, and most importantly to our lovely brides and grooms– without their support, we would not have been nominated, let alone picked up the winners trophy. Thanks also to the judges who spent over 500 hours researching and making the final decisions- we are totally delighted and very grateful to all concerned. Definitely one of the most amazing nights of our professional lives, and our phones have been a wee bit busier than normal in the last few months! We do still have limited availability for the summer of 2018 and 2019, so if you are interested in visiting us at the bakery for a wedding cake consultation, please get in touch soon- we would LOVE to hear from you.